In the past fifteen years organic photochemistry has undergone a greater change and has stimulated more interest than probably any other area of organic chemistry. What has resulted is a population explosion, that is, an ever-increasing number of organic chemists are publishing important and exciting research papers in this area. Professor Bryce-Smith in the introduc­ tion to a recent volume of the Specialist Periodical Report (Photochemistry, Volume 6), which reviews the photochemical literature in yearly intervals, states that "the flood of photochemical literature is showing some signs of abatement from the high levels of two or three years ago .... " However, Volume 6 of that periodical contains 764 pages of excellent but very concise reviews. We expect the development of the mechanistic aspects of organic photo­ chemistry to continue at the present pace as new methods are developed to probe in increasing detail and shorter time scales the photochemical dynamics of both old and new photoreactions. Since photochemistry is no longer the sole domain of the specialist, it is relatively safe to predict a dramatic increase in the near future of the synthetic and industrial uses of organic photo­ chemistry . 1 Basic Photophysical and Photochemical Concepts.- 1.1. Introduction.- 1.2. Energy Distribution in the Excited Molecule.- 1.2a. Light Absorption.- 1.2b. Internal Conversion and Intersystem Crossing.- 1.2c. Fluorescence and Phosphorescence.- 1.3. 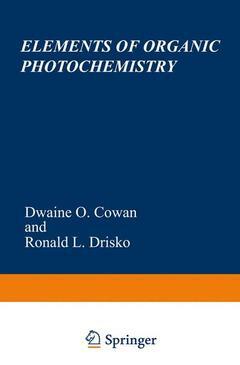 Photochemical Kinetics: Concentrations, Rates, Yields, and Quantum Yields.- 1.4. Classification of Molecular Electronic Transitions and Excited States.- 1.4a. ? ? ? * Transitions.- 1.4b. n ? ? * and l? a? Transitions.- 1.4c. Intramolecular Charge-Transfer Transitions (CT).- Problems.- 2 Photochemical Techniques and the Photodimerization of Anthracene and Related Compounds.- 2.1. Absorption and Emission Spectra.- 2.1a. Transition Probability.- 2.1b. Polarization Spectra.- 2.1c. The Measurement of Fluorescence Spectra and Fluorescence Quantum Yields.- 2.1d. The Measurement of Fluorescence Lifetimes.- 2.2. The Photodimerization of Anthracene and Related Compounds.- 2.2a. Structural Aspects: The Effect of Substituents on the Photodimerization.- 2.2b. Preparative Photochemical Techniques.- 2.2c. Kinetic and Mechanistic Aspects of the Anthracene Photodimerization.- 2.3. The Anthracene Triplet State.- Problem.- References.- 3 Photochemical Techniques and the Photochemistry of Ketones.- 3.1. The Photoreduction of Aryl Ketones: Nature of the Excited State.- 3.2. Flash Photolysis.- 3.3. The Photoreduction of Aryl Ketones: Structural Aspects.- 3.4. The Photoreduction of Aryl Ketones: Secondary Reactions.- 3.5. The Photoreduction of Aryl Ketones: Synthetic Applications.- 3.6. The Photoreduction of Alkanones.- 3.7. Intramolecular Hydrogen Abstraction by Ketones (Type II Cleavage).- 3.7a. The Multiplicity of the Excited State.- 3.7b. Stereoelectronic Effects.- 3.7c. Substituent Effects.- 3.7d. Synthetic Applications.- 3.8. Hydrogen Abstraction by Groups Other Than the Carbonyl.- Problems.- References.- 4 The Photochemistry of Simple Carbonyl Compounds: Type I Cleavage and Oxetane Formation.- 4.1. Type I Cleavage.- 4.1a. The Nature of the Excited State: Part I.- 4.1b. Some Examples and Synthetic Applications of Type I Cleavage Reactions.- 4.1c. Type I Cleavage Reactions Resulting in Loss of Carbon Monoxide.- 4.1d. ?-Cleavage of Cyclopropyl Ketones.- 4.1e. The Nature of the Excited State: Part II.- 4.2. The Formation of Oxetanes from Carbonyls and Olefins.- 4.2a. Oxetane Formation from Olefins and Aryl Ketones and Aldehydes.- 4.2b. Synthetic Applications of Oxetane Formation.- 4.2c. Oxetane Formation from Olefins and Aliphatic Aldehydes and Ketones.- 4.2d. Perturbational Molecular Orbital Theory (PMO) Applied to Oxetane Formation.- Problems.- References.- 5 The Triplet State.- 5.1. Introduction.- 5.1a. The Identity of the Phosphorescent State as a Triplet.- 5.1b. The Definition and Properties of a Triplet State.- 5.2. Determination of Triplet Energy Levels.- 5.2a. Phosphorescence Spectroscopy.- 5.2b. Singlet ? Triplet Absorption Spectra.- 5.2c. Phosphorescence Excitation Spectroscopy.- 5.2d. Flash Photolysis.- 5.2e. Electron Excitation.- 5.2f. The Lowest Triplet Levels of Organic Molecules.- 5.3. Determination of the Efficiency of Intersystem Crossing.- 5.3a. Flash Photolysis.- 5.3b. Triplet-Sensitized Isomerization.- 5.3c. Photooxidation.- 5.3d. Delayed Fluorescence.- 5.3e. Electron Spin Resonance Spectroscopy.- 5.3f. Intersystem Crossing Quantum Yields of Organic Molecules.- 5.4. Determination of Triplet Lifetimes.- 5.4a. Flash Photolysis.- 5.4b. Luminescence Decay.- 5.4c. The Effect of Deuteration on Triplet Lifetime.- 5.4d. Triplet Lifetimes of Various Organic Molecules.- 5.5. Excited State Geometry.- 5.6. Spin-Orbit Coupling and Intersystem Crossing.- 5.6a. The Nature of Spin-Orbit Coupling.- 5.6b. Effect of Heavy Atoms on Intercombinational Transitions in Aromatic Compounds.- 5.6c. Effect of Heavy Atoms on Intercombinational Transitions in Carbonyl and Heterocyclic Compounds.- 5.6d. External Heavy-Atom Effects and Charge Transfer.- References.- 6 Electronic Energy Transfer.- 6.1. Excitation Transfer within a Chromophore System.- 6.1a. Internal Conversion and Intersystem Crossing Theory.- 6.1b. Radiationless Transitions: Phosphorescence Microwave Double Resonance.- 6.1c. Zero-Field Optically Detected Magnetic Resonance (ODMR).- 6.2. Theory of Excitation Transfer between Two Chromophores.- 6.2a. Radiative Transfer (Trivial Mechanism).- 6.2b. Resonance Transfer (Long-Range Transfer).- 6.2c. Energy Transfer via Exchange Interaction.- 6.2d. Exciton Transfer (Strong Coupling).- 6.3. Excitation Transfer between Two Chromophores.- 6.3a. Singlet-Singlet Energy Transfer (Förster Type).- 6.3b. Singlet-Singlet Energy Transfer via Collisions.- 6.3c. Intermolecular Triplet-Triplet Energy Transfer.- 6.3d. Application of Triplet-Triplet Energy Transfer.- 6.3e. Schenck Mechanism.- 6.3f. Intramolecular Triplet Energy Transfer.- 6.3g. Exciton Interaction.- 6.4. Exciplex Quenching.- References.- 7 Dienone and Enone Photochemistry.- 7.1. Dienone Photoreactions.- 7.2. Dienone to Cyclopropyl Ketone Formation.- 7.2a. 3–5 Bond Orders.- 7.2b. Zwitterionic vs. Diradical Intermediates.- 7.2c. Pivot vs. Slither Mechanism.- 7.3. Dienone to Hydroxy Ketone.- 7.4. Cyclopropyl Ketones.- 7.5. 2,4-Cyclohexadienones.- 7.6. Cyclohexenone Photorearrangements.- 7.6a. Aryl-Substituted Cyclohexenones.- 7.6b. Alkyl-Substituted Cyclohexenones.- Problems.- References.- 8 The Di-?-Methane Photorearrangement.- 8.1. Acyclic Di-?-Methane Photorearrangement.- 8.1a. Regiospecificity and Stereochemistry.- 8.1b. Substitution at the Central sp3 Carbon Atom and Di-?-Methane Reactivity.- 8.1c. Reaction Rate Constants.- 8.2. Aryl Di-?-Methane Photorearrangement.- 8.3. Bicyclic Di-?-Methane Photorearrangement.- 8.3a. Barrelene.- 8.3b. Benzobarrelene.- 8.3c. Naphthobarrelenes.- 8.3d. Anthrabarrelene.- 8.3e. Other Selected Examples.- 8.4. Oxa-di-?-Methane Rearrangement.- Problems.- References.- 9 Photochemical Cis-Trans and Valence Isomerization of Olefins.- 9.1. Introduction: Cis-Trans Isomerization of Stilbene.- 9.2. Potential Energy Diagrams.- 9.3. Photosensitized Stilbene Isomerization.- 9.4. Nonvertical Energy Transfer.- 9.5. Stilbene Isomerization via Direct Photolysis.- 9.5a. Vibrationally Excited Ground State.- 9.5b. Triplet State Mechanism.- 9.5c. Singlet State Mechanism.- 9.6. Substituted Stilbenes.- 9.7. Piperylene Photochemistry.- 9.8. Alkene Photoisomerization.- 9.9. Intramolecular Cycloaddition Reactions.- 9.9a. Theory.- 9.9b. Intramolecular (2 + 2) Cycloadditions and Cycloreversion Reactions.- 9.9c. Intramolecular (4 + 2) Photocycloaddition Reactions.- 9.10. Photoelectrocyclic Reactions.- 9.10a. Theory.- 9.10b. Examples of Electrocyclic Reactions.- Problems.- References.- 10 Photodimerization and Photocycloaddition Reactions Yielding Cyclobutanes.- 10.1. Photodimerization and Photocycloaddition Reactions of Olefins and Polyenes.- 10.1a. Photodimerization of Olefins and Polyenes.- 10.1b. Photocycloaddition Reactions of Olefins and Polyenes.- 10.2. Photodimerization and Photocycloaddition Reactions of Aromatic Compounds.- 10.3. Photodimerization and Photocycloaddition Reactions of ?,?-Unsaturated Carbonyls and Acid Derivatives.- 10.3a. Photodimerization of ?,?-Unsaturated Carbonyls and Acid Derivatives.- 10.3b. Photocycloaddition Reactions of ?,?-Unsaturated Carbonyls and Acid Derivatives.- 10.4. Dimerization in the Solid Phase.- References.- 11 Photoelimination, Photoaddition, and Photosubstitution.- 11.1. Photoelimination Reactions.- 11.1a. Photoelimination of Nitrogen.- 11.1b. Photoelimination of Nitric Oxide from Organic Nitrites.- 11.1c. Miscellaneous Photoeliminations.- 11.2. Photoaddition Reactions.- 11.2a. Photoaddition of Water, Alcohols, and Carboxylic Acids.- 11.2b. Miscellaneous Photoadditions.- 11.3. Photosubstitution Reactions.- References.- 12 An Introduction to Photobiology.- 12.1. Photosynthesis.- 12.1a. The Photosynthetic Apparatus.- 12.1b. A Mechanistic Model for Photosynthesis.- 12.2. The Photochemistry of Vision.- 12.2a. Anatomy of the Human Eye.- 12.2b. The Visual Pigments and the Chemistry of Vision.- 12.3. Phototaxis and Phototropism.- 12.4. Damage and Subsequent Repair by Light (Photoreactivation).- 12.4a. The Photochemistry of the Nucleic Acids.- 12.4b. Photoreactivation.- References.